Mark Brinkley (aka House 2.0): Is this the end of passive solar design? Is this the end of passive solar design? I learned something about the Kingspan Lighthouse (pictured) this weekend, something that I’d completely missed when I visited it at Offsite 07 in June, where it got star billing as the first Code for Sustainable Homes Level 6 house to be completed. The Lighthouse reverses the conventional wisdom on orientation. There is only one tiny window, indicated by my arrow, facing south. The bulk of the glazing faces east, west and north. In contrast, the south face is almost covered in photovoltaics and thermal solar panels. Why? It seems the logic is thus. The space heating requirement has been all but insulated out of the house and the free heat arriving from the sunny south just isn’t needed in the winter heating season. And in the summer, south-facing glazing just leads to a mammouth overheating problem. It is, I think, the first house in the UK that identifies summer overheating as a bigger issue than winter warming. Now whether this novel approach proves popular with the punters remains to be seen. But Potton Homes, recently taken over by Kingspan, feel very confident that the Lighthouse design approach is going to be a winner. They are busy incorporating Lighthouse into their brochure offerings and plan a launch event at the upcoming Grand Designs show, taking place at the NEC, October 5-7. Coincidentally, this all chimes in with a talk given by Simos Yannas of the Architectural Association last week at the Nottingham Zero Carbon Symposium. Yannas has spent much of his working life studying passive solar design and admitted that he has always been attracted to the concept. Despite this, he has recently and reluctantly come to the conclusion that massive insulation trumps passive solar everytime. If you engineer the house down to Passivhaus levels of heat loss, solar gain just ends up being a problem. It’s unpredictable and uncontrollable and there are very few days in a year when it actually makes a useful contribution to the heating load. This all started when XCO2 did a bunch of work for Kingspan/Tek-Haus about 5 years ago that illustrated this very issue. Their product achieves good U-values and has the potential for exceptional airtightness. It is also lightweight and has no thermal capacity to store passive solar gain. Avoiding direct south facing glazing is a must then. On the plus side, a lightweight house also benefits from a quick heat response, so there is no need for background heating to maintain a desirable temperature when the occupants are out. Couple of longer term issues strike me here. Firstly, we shouldn't underestimate the quality of life issues that come from enjoying south facing spaces (and the resultant attitude to the way you use the space when you are more in touch with the seasons). Secondly, an architecture that relies on its fabric and layout for a balanced environmental performance is surely better than one than is dependent on tech products with a finite shelf life and maintenance burden? Will perhaps have to come back to you on this one, as I have a number of projects on the drawing board that will be testing all this (with and without solar passive techniques) soon I hope. 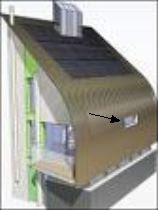 Uncontrollable solar gain into lightweight houses is the problem this design addresses by elimination of south facing windows and inclusion of a heating system in the house. Good passive solar design does not suffer from overheating in summer and can benefit from solar gain in winter to the extent that the heating system can be eliminated, thereby reducing build and running costs. Also it should be noted that solar gain from the west can provide more overheating problems than from the south during the summer months particularly in lighter weight buildings-also a well documented issue in commercial buildings. Unwanted solar gain from the south is eaily managed without reducing south facing glazing, but you cant get any gains when you want them if you dont have the glazing to start with. Incidently, as well designed sunspaces can capture and make available far more energy than other renewables, why are they not elegible for grants? Mark - I see the Lighthouse has been pulled down at the BRE Innovation Park - have you heard why? How should we manage water use in the home?